We are an eminent manufacturer & supplier of a wide range of Dynamic Demonstrators. Manufactured using advanced technology, these demonstrators have in-built power supply. Further, our products are include commonly used SSI and MSI devices. We manufacture these products keeping in mind the international quality standards and norms. These demonstrators are demanded in engineering institutes owing to their user-friendliness, durability and accurate results. ADTRON’s Analog Frequency Meter demonstrator is a versatile self – contained stand – alone unit useful in the study and demonstration of the principle of our analog frequency meter. The unit consists of a frequency to voltage converter, a buffer amplifier and a large analog meter. 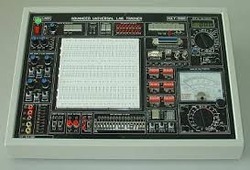 The meter is calibrated to read the input frequency in the range of 10Hz to 100KHz. The unit is housed in a specially designed users friendly elegant powder coated metal cabinet with an intelligently designed layout on the front panel. Input Signal : Sine, Square or triangular from an enternal function generator. Measurement Range : 1Hz to 100KHz in five ranges of 10Hz, 100Hz, 1KHz, 10KHz and 100KHz switch selectable. Output Indicator : Calibrated large Analog meter ( multiply the reading of the meter by the range in which you are measuring and the result gives the input frequency ). Instrumentation : Consists of a frequency to voltage converter and a buffer amplifier. Controls : a. Mains ON / OFF. Power Requirements : 230V, 10 % AC, 50Hz 1ph . Panel Size : 10” x 13”. Standard Accessories : 1. Detailed Instruction Manual. 2. Required number of patch cords. Bread Board : Bread Board For Making Various Circuits & Testing Them. Interconnection Through Detachable Flat Ribbon Cables. All Rotary Switches With Dap Material. 0 To 12v – 500ma, 0 To -12v – 500ma. 5 Ac Supply : 9v – 0v – 9v / 500ma. 1hz To 100khz Modulation / Audio. 8 Continuity Tester : For Testing The Continuity. Provided With Beeper Sound. 9 Interconnection For Modules : 2 Mm Patch Cord. 10 Power Requirement : 230v 10%, 50hz. Transistor Characteristics Common Base – Npn. Transistor Characteristics Common Base – Pnp. Transistor Characteristics Common Emitter – Npn. Transistor Characteristics Common Emitter – Pnp. Transistor Characteristics Common Collector – Npn. Transistor Characteristics Common Collector – Pnp. * Demonstrates the principle and working of an analog multimeter. * Supply required 230V 50Hz AC. * Built – in IC based DC regulated power supply with short circuit protection and indication for supply “ON”. * Assorted resistors of various selected values. * Measures AC / DC voltage, DC current and resistance. * DC Voltage : 0 to 0.5V, 0 to 2.5V, 0 to 10V, 0 to 250V, and 0 to 100V in six selectable ranges. * AC Voltages : 0 to 10V, 0 to 50V, 0 to 250V, 0 to 1000V in four selectable ranges. * DC Current : 0 to 50 micro A, 0 to 2.5mA, 0 to 25mA, 0 to 500 mA in four selectable ranges. * Ohmmeter : 0 to 2K, 0 to 20K, 0 to 2m, 0 to 20m in four selectable ranges. * Multi – coloured test points at various stages in the circuit to observe the waveforms and voltages. * Demonstrates the principle and working of a digital frequency counter. * Power required 230V, 50Hz, 1 phase AC. * Built – in 8 – digit seven segment digital display. * Built – in LSI dedicated chips. * Facilities to measure frequencies upto 10MHz on 8 – digit display. 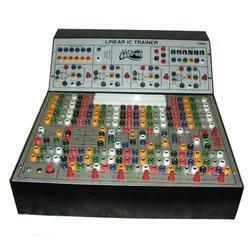 *Housed in an elegant metal cabinet with a well spread intelligently designed circuit layout on the front panel. *Strongly supported by a comprehensive instruction manual complete with theory and operating details. 1. 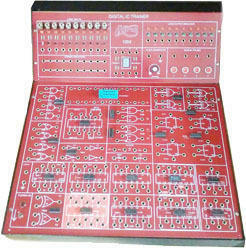 Ideal tool for learning the basics of digital logic circuits. 3. 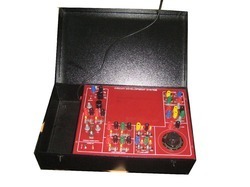 Comprehensive power supply, signal and testing devices for convenient experiments. points ) for circuit design and prototyping. 5. Capable of processing TTL, CMOS, NMOS, PMOS & ELC Circuits. 6. All supply units are equipped with overload protection for better safety. 1. Voltage Range : 5V / 1.5A; -5V / 0.3A; 12V, 0.3A. 1. Voltage Range : 0 to 15V. 2. Maximum Current Output : 0.5A. 3. With output overload protection. 1. Frequency : 1MHz, 50Hz, 1Hz. 2. Accuracy : 0.01% ( 1MHz ). 3. Fanout : 10 TTL load. 1. Frequency : 1Hz ~1MHz ( 6Ranges ). 1. 2 x 8 – bit DIP switch, 16 – bit TTL level output. 2. 4 x toggle switch, each with DEBOUNCE circuit. 1. 2 sets of independent control output. 2. Each set with Q, Q’ output, pulse width > 5mS. 3. Each set of switch with DEBOUNCE circuit. 2. Output Voltage : 6V rms. 2 digit, BCD code output, common point input. 1. 16 sets of independent LED to indicate high and low logic state. 2 Input Impedance : < 100KW. 1. 4 sets of independent 7 segment LED display. 2. With BCD, 7 segment decoder / driver and DP input terminal. 3.. Input with 8 – 4 – 2 – 1 code. 1. TTL and CMOS level. 3. “LOW” and “HI” LED displays low and high logic state respectively. 1. An 8Ω, 0.5W speaker with driver circuit. 1. 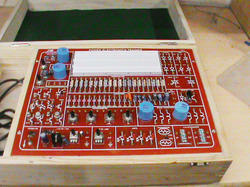 1680 tie point breadboard on top panel can be easily put into and taken off. 1. Connect Lead : 1. 2mm – 0.65mm, 300mm L 06 Nos. 2. 2mm – 2mm, 450mm L 10 Nos. 2. Test Probe : 2mm – 2mm, 600mm L 01 No. various problems by setting the DIP – switch to different positions. Solutions for all faults are listed in the experiment manual for user’s reference. 2mm plugs and sockets used throughout the lab and all modules. Comprehensive experiment and instructor’s manual. * Power required 230V, 50Hz AC. * Built – in 3½ digit seven segment LED display. * Built – in LSI dedicated single chip A / D converter. * Built – in 1 : 10, 1 : 100, 1 : 1000 attenuators. * Built – in constant current source. * Built – in highly sensitive AC rectifier. * Measures AC / DC voltage, AC / DC current and resistance with polarity indication. * AC / DC Voltage : 0 – 200mV, 0 – 2V, 0 – 200V in four selectable ranges. * AC / DC Current : 0 – 2mA, 0 – 20mA, 0 – 200mA, 0 – 2A in four selectable ranges. * Resolution : Voltage – 100 microvolt on 200mV range Current – 1 micro amp on 2 mA range. * Lucidly illustrated User’s Manual unravels electronics concept through brief theoretical reviews followed by experiments, self – test questions and exercises. * Built – in power supplies provide all the voltages necessary for experimentation.4 Modularly designed patch panel contains all commonly used discrete components. * Ohms Law, RC – High pass and Low pass circuits, RL – High pass and Low pass circuits, RLC series and parallel resonance circuits, Kirchoff’s Current and Voltage laws. * Transformer’s turns ratio, Efficiency of a transformer, Relay as a switch. * Diode characteristics, Clipping and Clamping circuits, Half – wave and Full – wave rectifiers, Zener diode characteristics, Regulators ( Line and Load ), Diode Logic gates. * Transistor (s) characteristics of CB, CE & CC configurations. * Transistor (s) amplifiers ( CB, CE & CC ), Power amplifiers, Differential amplifiers, Feedback amplifier current series and current shunt, RC phase shift oscillator, Bistable, Monostable and Astable Multivibrators, Schmitt Trigger, Transistor Logic gates. * FET characteristics, FET as a source follower, FET as a voltage variable resistor. * UJT characteristics, UJT as a relaxation oscillator. * Triac / Diac characteristics, power control using Diac and Triac. 1. Output voltage and current : 1. 5V / 250mA. 3. – 12V / 250mA. 4. 0 – 30V / 1A variable. 5. 0 – 70V / 50mA variable. * All the power supplies are regulated and short circuit protected. Load Regulation : 1 % ( No load to Full load ). Line Regulation : 1 % (for 10% variation in line voltage ). Ripple : < 12 mV rms. * 6 Bipolar, 1 Power and 1 matched transistor pair, 2 FET, UJT, 1 PUT & 1 MOSFET. * 9 Diodes and 6 Zener diodes ( of different values ). * 1 Triac / Diac pair, 1 SCR & 1 LDR. * 68 Resistors covering all standard values from 10 W to 5 M1 ( carbon film type ). * 18 assorted values of capacitors from 100 pF to 100 μF. * Potentiometers ( 2 for variable power supplies, 3 others ). * 2 Fixed Inductors ( 100 μH, 1 mH ). * 1 12V / 1 C.O. Relay. * 1 Audio Transformer ( 2 : 4 ). * 1 Power Transformer with centre tap ( 12 – 0 – 12 ). * One speaker : ( 8E / 0.5W ). 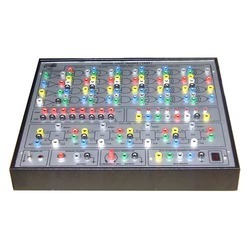 * 5 Logic inputs switches with LED indication. * Breadboard Terminal Strip with 640 tie points. * 1 Digital Voltmeter ( Dual range ) and 1 Current meter ( Dual range ). 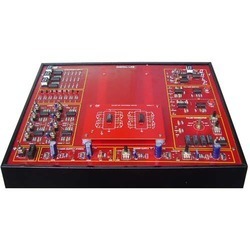 Study and verify the characteristics of various devices such as Diodes, ( Si / Ge / Fast switching ), Transistors ( CB, CE, CC for different NPN & PNP transistor ), FET, UJT, MOSFET, SCR, Diac, Traic, LDR, Zener Diodes, LED’s. Study working of resistors, capacitors, inductors, potentiometers, output transformer, speaker, relay. Study and verify the basic theorems & laws such as resistors / capacitors / inductors in series / parallel and combinations thereof, Ohm’s laws, Kirchoff’s voltage law, Kirchoff’s current law. Study and verify the RC, RL & RLC series & parallel resonance circuits, filters ( LP, HP, BP, BR ). students and researcher interested in training, developing and testing circuit prototypes. 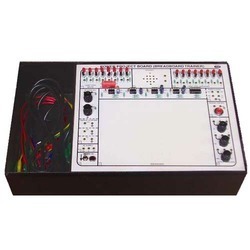 Ideal for very basic electricity / electronic circuit experiments and design exercises. Integrated trainer with experiment modules & complete curriculum. All modules equipped with an 8 – bit DIP switch for fault simulation. 1. Voltage Range : 5V, 12V. 2. Maximum Current Output : 0.3A. 1. Voltage Range : 0 to 15V continuously adjustable. 2. Maximum Current Output : 1A. 1. Voltage Range : 9V ~ 0V ~ 9V. 2. Maximum Current Output : 500 mA. 1. Output Waveform : Sine, Square and Triangle. 3. Accuracy : 5 % of full scale value. 4. Output Impedance : 50Ω. ( with 50Ω load ). 1. DC Voltage Range : 2V, 200V. 2. DC Voltage Accuracy : 0.3 % of reading 1 digit fsd. 3. DC Current Range : 200μA, 2A. 4. DC Current Accuracy : 0.5% of reading 1 digit fsd. ADTRON’s Instrumentation Tutor is a very versatile training system. It consists of a wide range of transducers, its various instrumentation and signal processing methods necessary associated power supplies, excitation sources and various electromechanical jigs and fixtures for actual working of the various transducers. ADTRON’s Instrumentation Tutor is modular in format, wherein each transducer is treated individually and then, using the electronic instrumentation, it is shown how they integrate into complete measurement system. The various transducers covered in this instrumentation tutor utilizes a variety of physical properties so that in total a very comprehensive treatment of the subject is achieved. 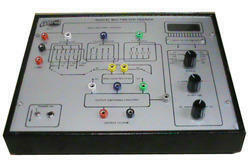 ADTRON’s Instrumentation Tutor is specialized bench – top modular study system divided into 2 parts. It is suitable for most Engineering disciplines. Here mathematics is kept to minimum level consistent with that necessary to cover the subject adequately. The coverage is equally suitable for fields of electronics and electrical engineering, chemical engineering, process control and instrumentation physics and also mechanical engineering. Instrumentation Tutor Part IV consists of Measurement of Pressure using Pressure Transducer, Measurement of Force using Transducer. Transducer : Diaphragm type with Strain Gauge mounted in bridge configuration. Range : 0 to 10 Kg / cm2. Excitation Source : Regulated DC for circuit. Readout : 3.5 digit digital display in mV DC. A special chamber with pressure transducer mounted on one side and on the other two valves ( one for connecting pressure pump and one for releasing the pressure ) is provided. Zero and span adjustment facility using two ten potentiometers is provided on the front panel. Type : Universal type load cell used in tension mode. Transducer : S beam type load cell with full bridge strain gauge configuration. Range : 0 to 10 Kg. A special arrangement with spring balance coupled to load cell with one end of load cell fixed is provided. Zero and span adjustment facility using two ten – turn potentiometers is provided on the front panel. For Module IV ( Part IV ) a common digital readout ( for all transducer ) is provided. # 9 pin Female D Connector to connect the serial port of the PC. # LED’s provided for all port lines to indicate the status. # All segments including ‘ . ‘ are provided on Data port through buffer for interfacing with parallel port, serial port ( uC ) or 82C55. User’s Manual details experiments that takes one on a planned journey through the micro electronic world of linear IC building blocks such as Op - amps, Timers, Voltage regulator IC’s etc. Built - in power supplies provides all necessary supplies for experimentation. Patch panel contains all commonly used Linear IC’s. Study of major operational amplifier characteristics open loop gain, output resistance, differential input resistance, unity gain bandwidth, rated output, full power response, slewing rate, input offset voltage, input bias current, input noise current, CMRR, common mode input resistance, etc. Study of operational amplifier amplifications inverting amplifier, non-inverting amplifier, difference amplifier, inverting summing amplifier, voltage follower, differentiator, integrator, log amplifier, limiter, AC - DC converter etc. Study of the operation of monolithic voltage regulator (723). Study of the characteristics and operation of a high speed voltage comparator ( 710 ), study of comparator applications, Schmitt trigger, pulse width modulator, etc. Study of operation and characteristics of a Timer ( 555 ). Applications of timers in systems and circuit. Study of Phase Lock Loop ( 565 ), Measurement of important PLL characteristics: lock range, capture range, VCO sensitivity, VCO linearity etc. Output Voltage & Current : + 12V / 500mA - 12V / 500mA. 4Completely self - contained stand - alone unit. 4Self supporting no power required as the meter works on absorption type measurement. 4Power measurement upto 10W in two ranges. 4Simultaneous watt and db indications on single large meter. 4Choice of various terminating loads. 4Multi - coloured test points at various stages in the circuit to observe the waveforms and voltages. 4Set of required number of patch cords. 4Housed in an elegant metal cabinet with a well spread intelligently designed circuit layout on the front panel. 4Strongly supported by a comprehensive instruction manual complete with theory and operating details. 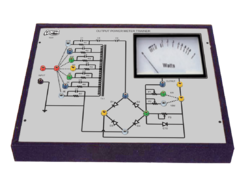 Programmable Logic Control Trainer is a versatile training system. 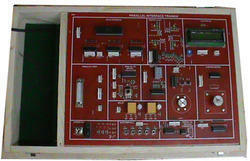 It is a unique modified version of an industrial PLC. It is designed in a manner to provide best training in a cost - effective manner. Various instrumentation / mechanical and control jigs / modules are provided along - with the trainer for explaining and performing various applications using a PLC. The main PLC unit is of modular construction, for ease of connection and operation. The program is built - in with computer support. Facility to cascade timer and counters. PLC unit of modular construction. 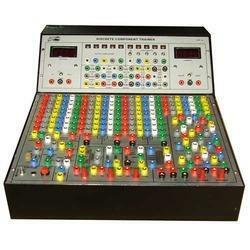 Analog : 2 channel, 2 input + 1 output. 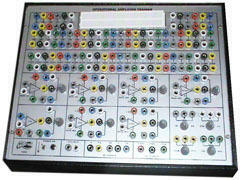 Digital : 14 channel input + 10 channel output ( optically isolated ). Input Voltage : 24V DC for relay operation. Input : 8 LED indication on panel. Output : 8 LED indication on panel. CPU / Memory : 8 bit Micro - controller with RAM & EPROM memory. IBM PC Link : UP / DOWN loading from PC through RS232 link. Software : Documentation support software on CD ( with ladder diagram programming software ). b.LVDT with lead screw arrangement ( motorized ) module. c.Conveyer belt, level control module. e.Pick and place Robo Module with stepper motor. g.Signal Conditioning module with thumb provided Wheel Switches. 2.Stepper motor speed and direction control. 3.Lamps ON / OFF control. 8.Water / Fluid Level Control. 9.Thumb - wheel Scan and Display. · Fairly comprehensive and exhaustive Instruction Manual complete with theory, procedure and operating details. # Two relays with P, NC and NO contacts. 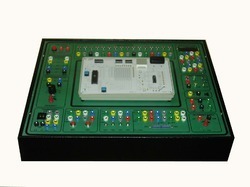 Power Electronics trainer is modular type circuits on glass epoxy PCB as front panel. The circuit layout is printed on the glass epoxy PCB with high quality printing. Test tags are provided to observe the waveforms and voltages. LED indicators are provided on each input and output of logic blocks to observe the instantaneous logic level. 2 mm holes test points ( multimeter cord compatible ) are provided at all the points where voltages has to be measured. Built in DC regulated power supply is provided making the kits suitable for operation at 230V AC. The trainer is housed in wooden cabinet with cover for safe keeping of trainer. Necessary connecting leads ( patch cords ), jumper link, detail operating & servicing manual with theory and waveform to be provided. 1. Built in UJT & PUT relaxation oscillator with mains synchronisation and isolated output for SCR & TRIAC. 2. Built in high voltage isolated AC 230V & dual 1.2 to 15V / 1A DC power supply. 3. Built in SCR & TRIAC AC phase control circuit by RC & UJT / PUT circuits. 4. Study of AC & DC timer & time delay relay using SCR & TRAIC by on board components. 5. Built in DC motor for study of speed controller circuit. 6. On board SCR, TRAIC, DIAC, UJT, PUT, LDR, PHOTO DIODE, NTC & PTC THERMISTOR, LAMP LOAD, NPN & PNP TRANSISTOR, MOSFET, OPTO ISOLATOR, PHOTO TRANSISTOR, LED, PULSE TRANSFORMERS, DIODES, POTENTIOMETER with 2 mm termination for assembling of circuits through patch cord & solder less breadboard. 7. Set of patch cords ( 25 Nos ) to be provided along the trainer. 8. 1:10 attenuator is provided on board ( 02 Nos ). 1. Study of SCR phase control by UJT, PUT, RC Triggering. 2. Study of TRIAC phase control by UJT, PUT, RC triggering. 3. Study SCR & TRIAC Timer. 4. Study SCR & TRIAC & MOSFET time delay relay. 5. Study of AC load switching by SCR & TRAIC. 6. Study of over & under voltage ALARM circuits. 7. Study of light and dark sensitive switches using SCR & TRAIC. 8. Study of SCR, TRIAC, DIAC, UJT, PUT, LDR, PHOTO DIODE, NTC & PTC, THERMISTOR, MOSFET characteristics. 10. Calculation of chopper efficiency. 2. Set of Patch cords. Breadboards Unique solder – less large size, spring loaded breadboard consisting of 2 Terminal Strips with 640 tie points each and 3 Distribution Strips with 100 tie points each, totaling to 1580 tie points. (size : 165mm X 170mm approx ). IC based DC Reg.Power Supplies a.b.c. 12 V / 500 mA ( fixed and with facility to vary from 0 to 12 V ).- 12 V / 500 mA ( fixed and with facility to vary from 0 to -12 V ). 5V / 500mA ( fixed ). Clock Generators a. 0.1Hz, b. 1Hz, c. 100Hz, d. 1KHz.Simultaneous independent fixed TTL ( 5V ) outputs. Logic Level Inputs Eight independent buffered logic level inputs to select High / Low TTL levels, each with a LED to indicate high / low status and termination. ADTRON’S Signal generator demonstrator is a versatile, stand – alone unit useful in the study of generation of sine and square waves. 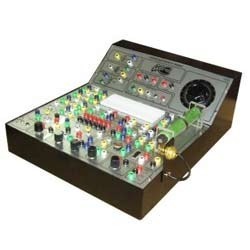 The unit consists of an oscillator, amplifier and a calibrated dial. The sine / square waves are generated in the range of 1Hz to 1MHz in Six ranges. The unit is housed in a specially designed user friendly elegant powder coasted metal cabinet with our intelligently designed layout on the front panel. Parameter Generated : Sine and Square waves. Output Waveforms : a. Sine Wave. Output Frequency : 1Hz to 1MHz Six ranges. Output Amplitude : a. Sine Wave – 10mv – 30V (pp ). b. Square Wave – 0 to 15V (pp ). Duty Cycle Variable : 0 to 70 % (Square Wave). circuit to observe waveforms and voltages. Power Requirements : 230V, 50Hz, 1f. Panel Size : 10” x 13’. 2. 15” Length Patch Cords with 4mm terminations on both sides ( 02 Nos ). 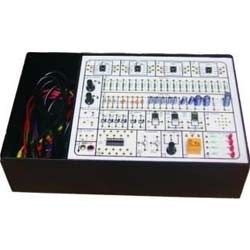  Ideal for electronic circuit experiments, learning the basics of digital logic circuits & design exercises.  Integrated trainer with experiment modules. 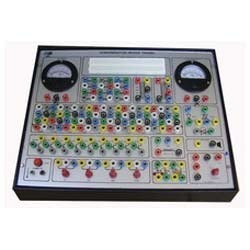  Complete with power supplies and test systems for easy and efficient experimentation.  Suitable for combined logic, sequential logic, circuit designing & experiments.  Comprehensive power supply, signal, pulser and display for convenient experiments.  Capable of processing TTL, CMOS, NMOS, PMOS & ELC Circuits.  All supply units are equipped with overload protection for better safety. Tie – Points : 1680. Frequency Range : 1Hz to 1MHz in 6 steps & variable in between steps. Data Switches : 8 Nos. LED Display : 8 Nos ( TTL / CMOS Mode ). Speaker : 8 ohms for audio use. Power Supply : 230V 10%, 50Hz. Interconnection for Modules : 2 mm patch cord. Standard Accessories : 1. Instruction Manual. Study of basic gates and verification of their truth tables ( NOT, OR, AND, NOR, NAND, EX – OR, EX – NOR ). Study and verifications of the laws of Boolean Algebra and De-Morgan’s Theorems. Study of important TTL terminologies. Verification of important TTL circuit parameters. Construction and verification of various types of flip-flops using gates & IC’s ( RS,JK,D,T,M/SJK). Construction and verification of various types of combinational circuits such as Half Adder, Full Adder, Half Subtractor, Full Subtractor, Even / Odd Parity Checker, Multipliexer, Demultiplexer, Binary to Gray & Gray to Binary Converters. various electromechanical jigs and fixtures for actual working of the various transducers. comprehensive treatment of the subject is achieved. chemical engineering, process control and instrumentation physics and also mechanical engineering. various sensors for Intensity measurement. 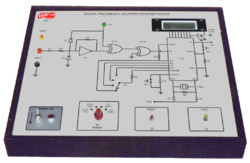 Temperature controller and indicator using RTD probe is useful in the study and demonstration of the principle and working of a temperature indicator and controller using RTD probe. An electronic closed loop temperature measuring and controlling system with variable set points, special heating unit and digital readout are provided. Control System : ON / OFF type. Type : PT – 100, immersion type probe in sheath with flange and flying leads. Sensor Calibration : Standard PT – 100 to DIN 43760. Sensor Accuracy : Class B type. Configuration : Bridge with one arm as RTD probe ( Wheat – stone’s bridge principle ). Sensor Range : 0 to 400C. System Range : 0 to 100C. Actual Heating Process : Heating unit of 200W capacity. Excitation Source : DC Regulated source. Set Point : Adjustable over full range. a. Set temperature in C.
b. Actual temperature in C.
Controls : 1. Set point controls. Study of operational amplifier ( op – amp IC 741 ) parameters such as input resistance, output resistance, slew rate, frequency response, input offset voltage, input offset current, input bias current, CMRR, differential input resistance, unity gain band width, rated output & full power response. Study of operational amplifier amplifications such as inverting amplifier, non – inverting amplifier, difference amplifier inverting summing amplifier and voltage follower. Study of operational amplifier basic applications such as adder, subtractor, multiplier, divider, Integrator, differentiator, limiter, comparator ( level detector ) and schmitt trigger. Study of operational amplifier advance applications such as active LPF / HPF, zero crossing detector, AC-DC converter and waveform generators. Study of operation and characteristics of a Timer ( IC 555 ). * Lucidly illustrated User’s Manual un – ravels electronic concept through brief theoretical reviews followed by experiments, self test questions and exercises. 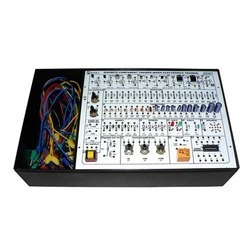 * Built – in power supplies provide all the necessary voltages for experimentation. * Modularly designed patch panel contains all commonly used discrete components. * Study of major operational amplifier characteristics, open loop gain, output resistance, differential input resistance, unity gain bandwidth, rated output, full power response slewing rate, input offset voltage, input bias current, input noise, current, CMRR, common mode input resistance etc. * Study of operational amplifier amplifications inverting amplifier, difference amplifier, inverting summing amplifier, voltage follower, differentiator, integrator, log amplifier, limiter, AC – DC converter, etc. * Schmitt trigger, pulse width modulator, etc. * Study of various waveform generators using operational amplifiers, Wein Bridge, Sine cosine, Square wave, Triangular wave, Saw – tooth wave generators, etc. * Study of active filters. * DC Regulated Power Supply : 12V / 500mA ( short – circuit protected ). -12V / 500mA ( short – circuit protected ). * AC Supplies : 7.5V. and 18 – 0 – 18V. IC 741 : 02 Nos. IC TL061 : 02 Nos. IC 710 : 01 Nos. IC 356 : 01 Nos. IC 3140 : 01 Nos. * 37 Resistors of assorted values from 100E to 20 Mohms. * 25 Capacitors ( including Electrolytic ) of assorted values from 100 pF to 10 μF. * 11 potentiometers for op – amp offset adjustments, & for other applications as required. * Built – in speaker ( 2 ½ ” round, 8E / 0.5W ). * Terminal strip solderless, Breadboard, Spring loaded with 640 tie points. Modularly designed total unit for R&D Engineers, Laboratories of Engineering Colleges, Polytechnics, Physics and other Departments and even hobbiests. Useful, low currents, mini lab with drastic savings in time and money as implementation/trying of new circuits is very convenient and easy. SCR’s ( 06 Nos. ). Triacs ( 03 Nos. ). Diacs ( 03 Nos. ). 1 : 1 : 1 Pulse Transformers ( 03 Nos. ). Selected values of resistors ( 05 Nos. ). Selected values of capacitors ( 05 Nos. ). Different types of Transistors ( NPN, PNP, Power Transistor & UJT ). Diodes ( High Current ) ( 06 Nos. ). Photo Transistor ( 01 Nos. ). Photo cell ( 01 Nos. ). SUS ( 01 Nos. ). SBS ( 01 Nos. ). PUT ( 01 Nos. ). Resistive load of 100E / 100W. 10 different values of zener diodes selectable by a switch. Three nos. of selected values of potentiometers. 0 – 30V /1A ( continuously variable ) load regulation 0.1% 1mV line regulation 0.1% 1mV. 12V / 500mA ( regulated ). Isolation transformer of 55 – 0 – 55V AC. Continuously variable 0 to 230V / 2A Variac. 2 ½” round, 8E / 0.5 W.
Breadboard consisting of one terminal strip, tie points 640 and 2 Distributing strips, tie – points 200 ( size 175mm x 61mm). Multi – coloured test points at various stages in the circuit to observe the waveforms & Voltages. any other component, thereby increasing the versatility of the trainer. 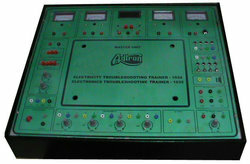 ADTRON’s Semi Conductor Device Trainer consists of the following housed in an elegant metal cabinet. * Diodes : Bank of 8 diodes. * Zener Diodes : Bank of 4 zener diodes. * NPN Transistors : Bank of 4 transistors. * PNP Transistors : Bank of 3 transistors. * UJT : 01 Nos. * SCR : 01 Nos. * Diac : 01 Nos. * Triac : 01 Nos. * LED : 02 Nos. * LDR : 01 Nos. * Coil : 01 Nos. * Relay : 12V – 1 C.O. * Speaker : 8E / 0.5W 2 ½” Round. * Bank of Potentiometer : 4 ( 1K, 10K, 100K 1M ). * Power Transformer : Py : 230V. Sy : 9V – 0 – 9V. * Audio Output Transformer : 2 : 4. * Voltmeter : Analog ( Dual Range ) 10V and 100V switch selectable. 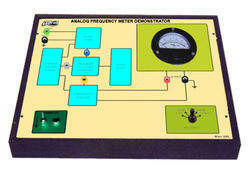 * Ammeter : Analog ( Dual Range ) 10mA and 100mA switch selectable. * Resistors : Bank of 30 resistors ( assorted values from 10 W to 820K ). * Capacitors : Bank of 10 capacitors (assorted values from 0.033 μF to 100 μF ). * Breadboard : Terminal strip with 640 tie points. * Power Supplies : DC Regulated with short circuit protection. 1. 0 to 30V / 1A ( continuously variable ). 2. 12V / 250 mA fixed. 3. – 12V / 250 mA fixed. ADTRON’S Telephone Demonstrator is a high technology, rugged, user-friendly replica of a professional electronic push button telephone receiver. 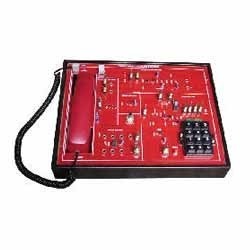 It uses the latest state of art technology based solid state Integrated Circuits, making it a highly reliable electronic telephone receiver designed to provide a high level of communication. ADTRON’S Telephone Demonstrator is a versatile training demonstrator, useful for studying the principle & working of an electronic push button telephone. 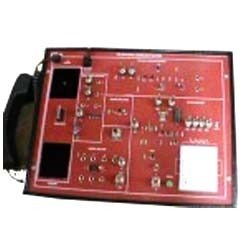 All the components are mounted on a single PCB with demarcated sections & test points. e. Hand set with cut off plunger type switch.  Fault creating facilities are provided, where by 13 faults can be created.  Telephone Set Type : Electronic push button type.  Dialing System : Pulse / Tone (selectable).  Connection : To be connected to a P & T line.  Ringer Volume : Volume Control for Ringer is provided. 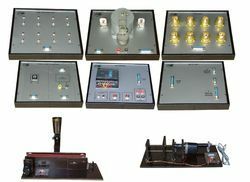  Keypad Switches : 0,1,2,3,4,5,6,7,8,9,*,# switches are provided.  Power Required : Derived from the P&T line to which it is connected. 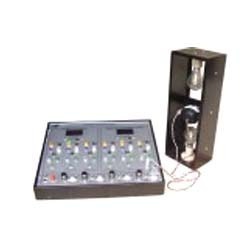 Keeping the updates of latest happening in this domain, we manufacture and supply the best quality of Telephonic Demonstrator. 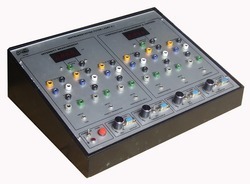 The offered telephonic demonstrator is used for studying the working of push button electronic telephone. 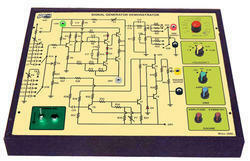 Its ease of learning and robust construction, make this telephonic demonstrator is highly demanded. Hand set with cut off plunger type switch. Fault creating facilities are provided, where by 13 faults can be created. Telephone Set Type: Electronic push button type. Dialing System: Puls /Tone (selectable). Connection: To be connected to a P & T line. Ringer Volume: Volume Control for Ringer is provided. 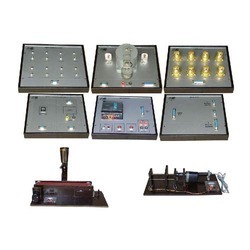 Keypad Switches: 0,1,2,3,4,5,6,7,8,9,*,# switches are provided. Power Required: Derived from the P&T line to which it is connected. With the aid of latest machinery and skilled workforce, we have been able to offer the finest quality of Digital IC Trainer Kit. 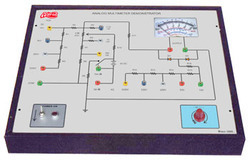 By using advanced machinery, the offered digital IC trainer kit is precisely fabricated as per the industry laid norms. 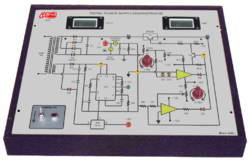 Owing to its in-built power supply and compact design, the offered digital IC trainer kit is highly demanded. Looking for Dynamic Demonstrators ?